Are you sending your CV and not getting a job interview? Do you need help getting a new job, changing your career, or applying for a university course? CV Made Better provide professional advice and a range of CV writing services that will present and display your skills, experience and suitability in the best possible light, getting your CV noticed. Our CV writing services include New CVs, CV Rewriting, Introduction Letters, Personal Statements, Selection Criteria, LinkedIn Profiles and CV Templates. For full details check out our CV Writing Services. CV Writing and how you present yourself is of the utmost importance. When you apply for a new job a company will ask to see your CV. This is your chance to make a good impression and introduce yourself. If the CV is badly written / presented or lacks relevant information about your experience, it could stop you from being considered for the reason you sent it in the first place, a job interview! No CV? 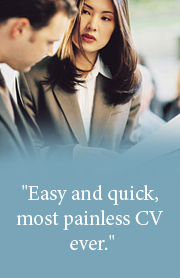 We can create a professional detailed New CV from scratch. Utilising your existing CV we will build you a New CV to be proud of. Perfect to support a CV or to be included with an application form. Send us the form and we will send you all the text to complete it. The perfect way to introduce yourself when applying to any job. Having trouble with those difficult questions? Let us answer them. "Very professional CV writing service I will recommend it to friends"
“My new job as a graphic designer starts shortly. Thanks for the CV, great work!" For what previous customers thought of our CV writing service please look at our full Customer Testimonials page. Since CV Made Better started in April 2007 our CV writing services have helped hundreds of people applying for a range of jobs in the Accounting, Construction, IT, Management, Marketing, Secretarial, Technical, Engineering, Medical and Legal professions, ranging from entry level to senior positions. Utilising our CV writing expertise we are able to create completely personalised CVs, which can be tailored to the role you are applying for, or provide a more general view of your career to date. Our skills lie in making your CV stand out. A well written, professional looking CV will help secure an interview rather than you being overlooked. Our personal and friendly CV writing service will dramatically improve your CV and help in securing a new job or a complete change of career. CV Made Better aims to complete all CV writing work within 48 Hours but can be done faster if needed. Once your order has been placed we will arrange your telephone consultation and send you an easy to complete questionnaire either via email or post. The consultation is a crucial part of the process as it allows us to gather further information to gain an in-depth understanding of your career history to date, experience and skills. The types of questions we ask will differ depending on the service being provided but the process will only take a maximum of thirty minutes. Within 48 hours of placing your order you will be sent a first draft to review. At this stage if necessary any additions or changes can be made. Once any adjustments are completed your final copy will be emailed to you in either, or both, a PDF / Word format depending upon your needs. All customers also receive a free 17 page Interview Preparation Guide that covers calming techniques, commonly asked questions and how to present yourself at an interview.